as a memorial and museum. 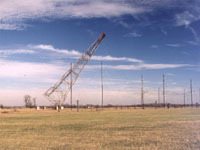 Voa tower falling in 1996. 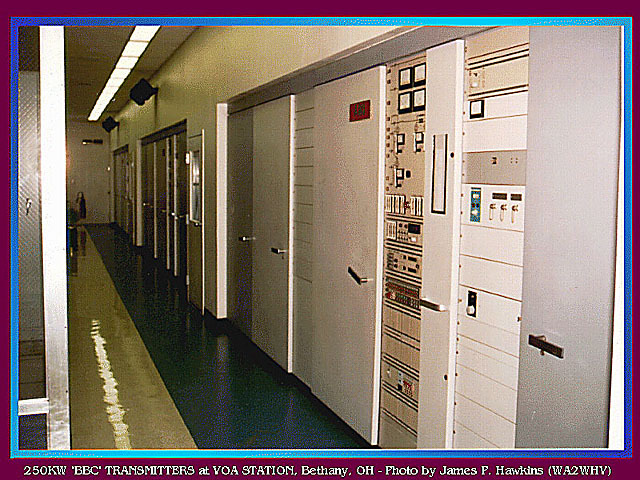 The Bethany, Ohio, Voice of America site featured here was taken out of service in 1995 due to budget cuts. Larger versions of all photos may be downloaded by clicking on them. Jim Hawkins - WA2WHV. 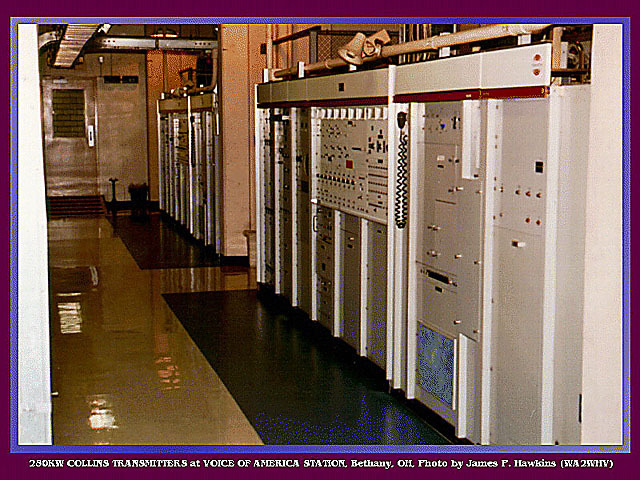 View of one of the Collins Transmitters View showing aisle of all three Collins transmitters. A schematic of the amplifier stages is part of the panel design showing relationship of controls to different stages of amplification on the Collins transmitters. 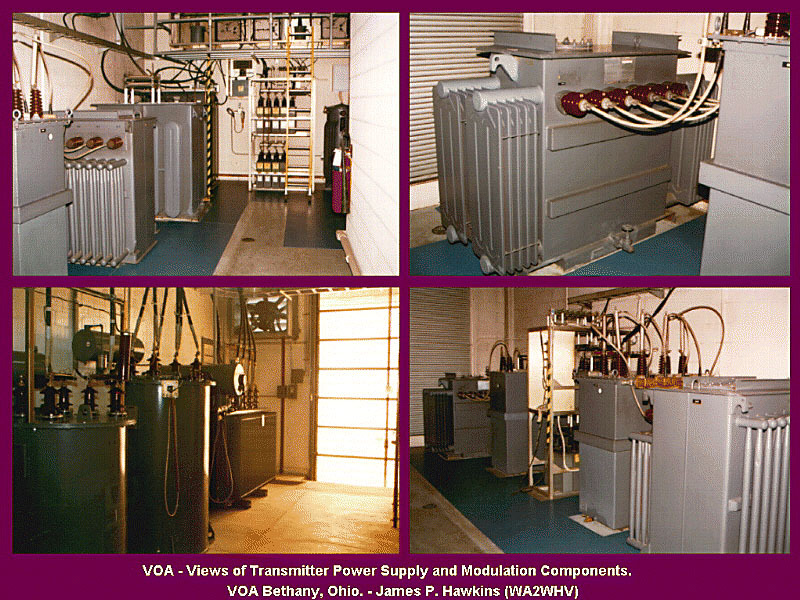 Four views of the chamber containing power transformers, solid state rectifiers, capacitors, chokes and modulation transformers for one of the Collins AM transmitters. The doors to the rooms were interlocked so that all power would be disconnected and capacitors shorted upon entering. The CE told us that an engineer had been "fried" some time ago when he accidently came in contact with a live line. These replaced three Crosley transmitters. 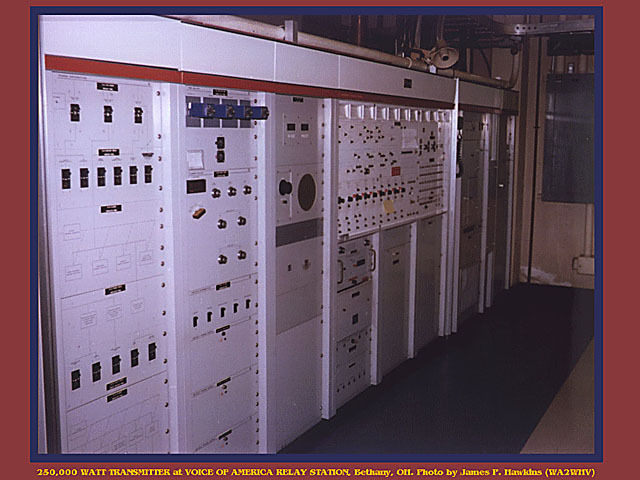 Aisle showing three BBC 250KW Transmitters, where the Crosleys were. 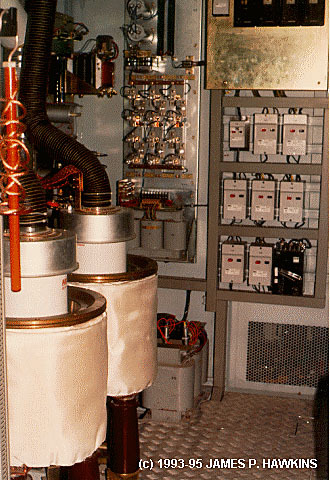 Open Audio Modulator cabinet with steam cooled tubes (on left). 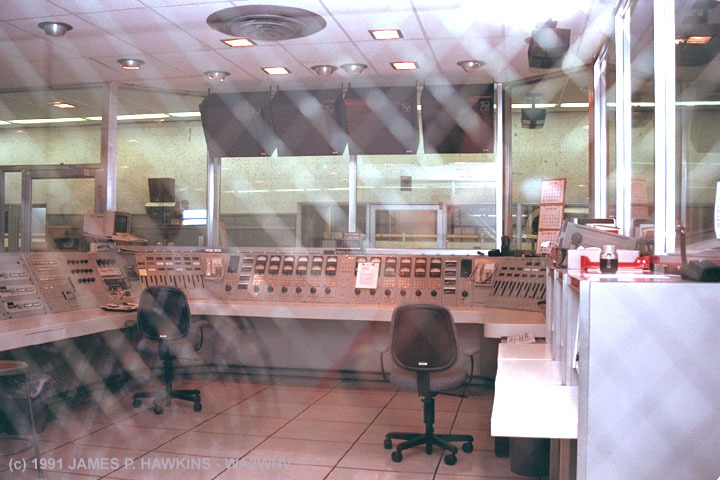 The BBC transmitter use vapor cooling for the final transmitter tubes. 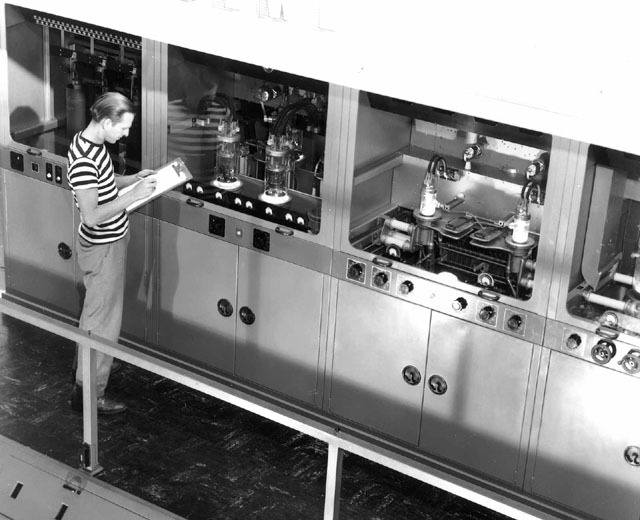 The tuneup procedure is computer automated. 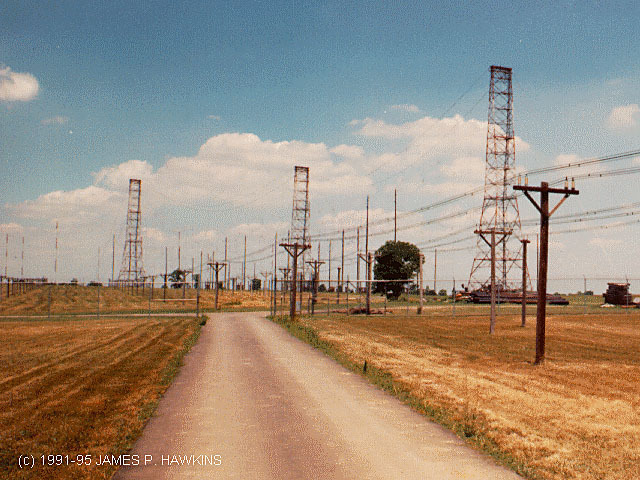 These transmitters were in the process of being installed when I first visited the site. They were replacements for three Crosley transmitters. Below is an interesting story sent to me by Bruce McLaughlin - W8FU. What happened to the Crosleys? 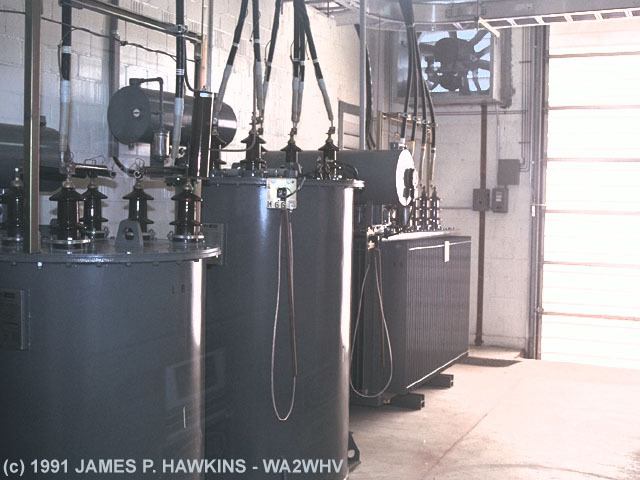 When I toured [the Bethany site], they still had three old Crosley 175 KW transmitters along with the three 250 KW Collins units as well as a very old Collins 5 KW SSB unit. The Crosleys were the originals (they had six at one time but three were replaced by the Collins units). The Crosley units were manually tuned. And to get down to the 6 Mhz region, it was necessary to crawl under the units and insert a Jennings fixed vacuum capacitor. The engineer let me crawl in with him when he did this! The power switches were actually padlocked when they did this (thank God). 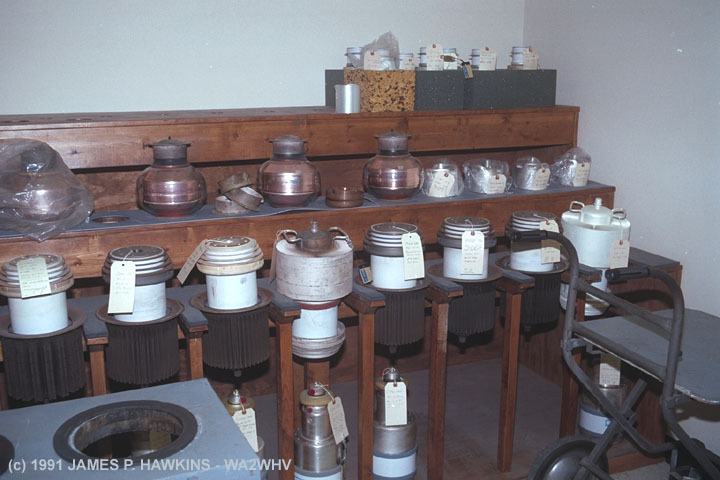 Except for replacing the original mercury vapor tubes with solid state rectifier stacks, the transmitters were more or less in the original state. They had a lot of glass doors so you could see most of the innards. The Crosleys were replaced by the BBC units in your shot. At the same time they spent a lot of money remodeling the place, including asbestos removal and getting rid of the old hugh PCB laden transformers and chokes. Within a few months of completion, the place was closed! The transmitters were shipped to Sri Lanka. The antennas are still there. 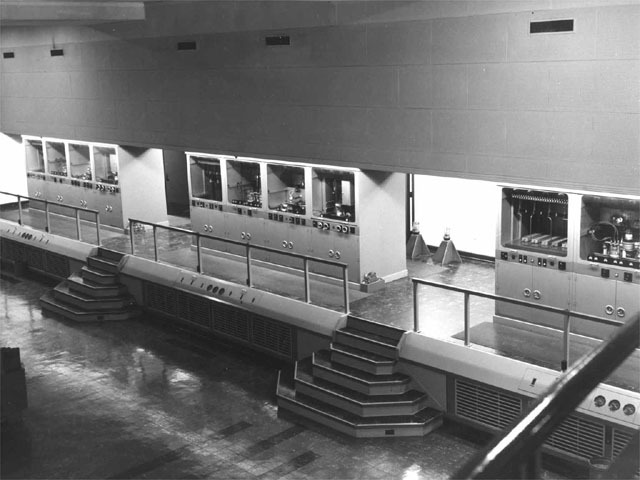 View of Crosley Transmitters in 1968. 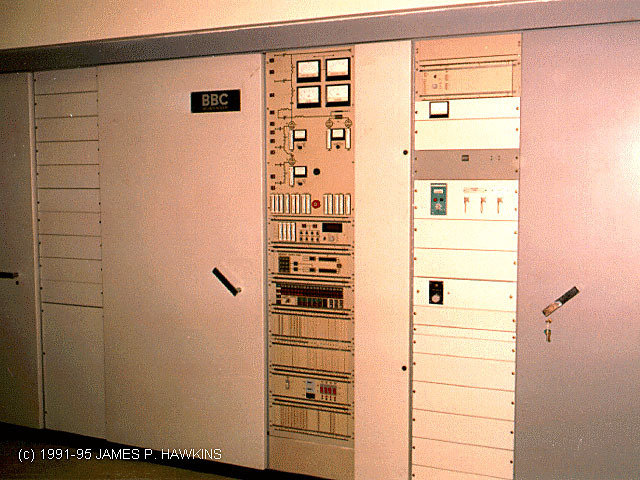 When we were in the commercial international broadcasting business we had one 50KW Crosley designed and built short wave transnitter. It's call was WLWO. During the early part of the WW II the OWI (Office of War Information) sent us an RCA short wave RF section and we acquired a modulator and power supply from KFAB in Lincoln Nebraska. This composite went on the air from the Mason site as WLWK. 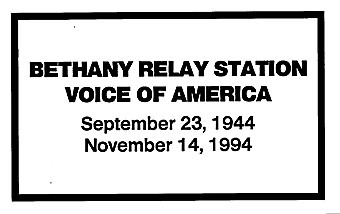 Later when we got the Bethany VOA plant on the air we used the Call letters of WLWL, WLWR and WLWS for all six transmitters. Bear in mind that we had six RF carriers and only three power supplies and modulators, therefore, each program was carried on two frequencies. 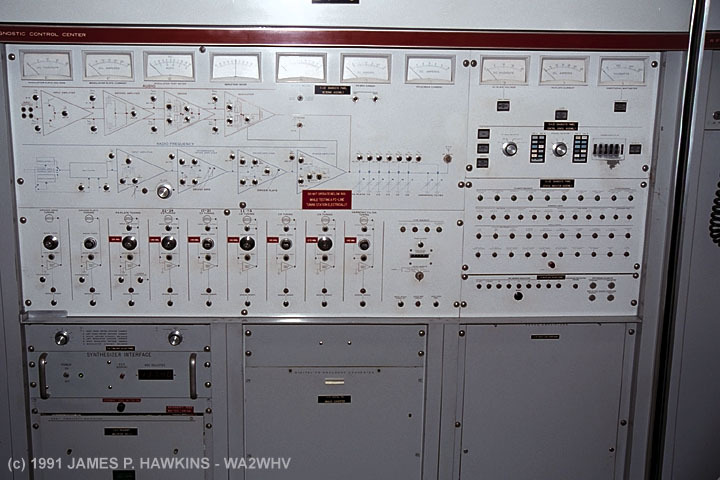 In the very early days pre-war we had a 1 KW short wave transmitter operating in the 6 Mhz band with call letters of W8XAL. 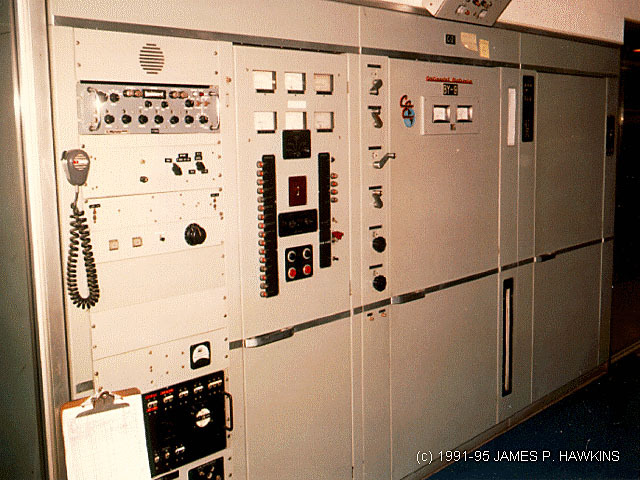 For many years this transmitter operated continuously for the National Bureau of Standards for recordings of solar flare activity. 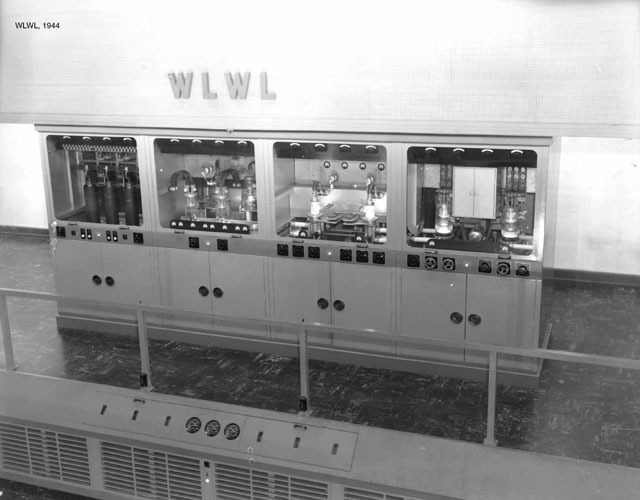 At one time we held every call from WLW to WLWZ. 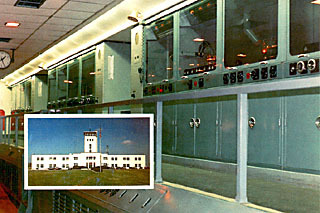 This transmitter is used as an emergency relay to another site, in case other links fail. The antenna switch is a matrix of completely hand operated switches. There is no remote control. Engineers must leave the building, enter the matrix and set up the individual switches to change antenna configurations. I asked why it wasn't more automated. The engineer giving us the tour said quite simple, "because it works fine the way it is". 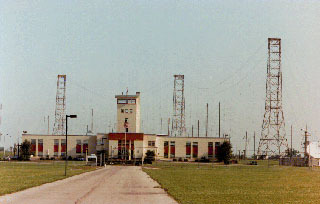 View of antenna farm showing two curtain antenna arrays and rhombics scattered about in the background. 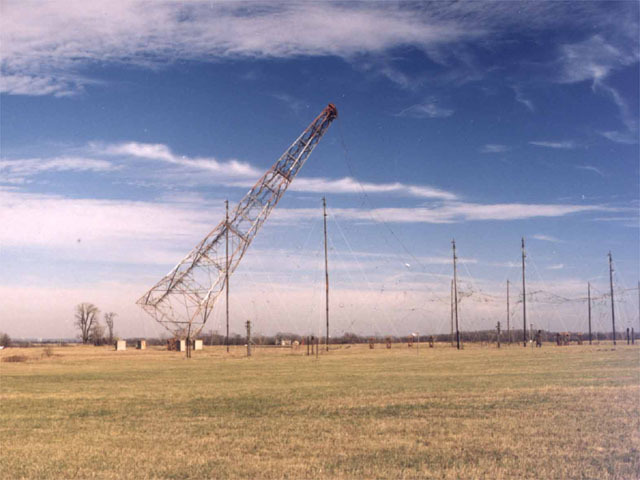 For an antenna farm layout, description of antenna direction and coverage and a brief history of the site and why it was placed in OHIO, click on the link. 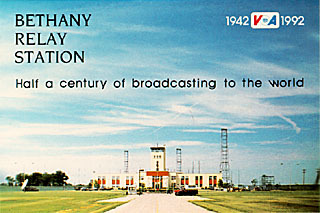 This QSL shows the three Crosley transmitters, which were in service from 1942 to 1989. They were replaced buy the ABB Transmitters shown on this page. 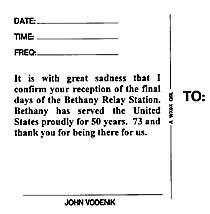 Having been employed at Bethany Relay Station for almost 10 years, I have a few stories I would like to tell. I'll start with the spark transmitter that a few of us constructed one slow Saturday. Since our primary function as technicians was to: 1. Get the transmitters on and 2. Keep them on, when things are going well, we kind of get bored. Back about 1994, a couple of us decided to see what it was really like back in the spark days. We gathered up a few transmitting caps from the Crosley transmitter stock, wound a couple coils, and built a spark transmitter. It was "breadboarded" on the workbench in the electronics repair shop. The antenna ran from the top of the guard tower, about 80 feet high, down to the front of my truck. From there, the wire ran into the building through a piece of fiberglass tubing, and connected to one of the caps. To get the high voltage, one of the guys brought in a furnace ignition transformer, so we had about 10,000 volts AC We found a CW hand key in my locker, and connected the 110 VAC from the wall outlet through the key contacts, and on to the transformer input. Somehow, we didn't kill ourselves. Every time we closed the key, there was a very LOUD crack, as the 110 VAC arced across the key, and then the spark gap came to life. The "operators" had to use hearing protectors, to deaden the sound. It could be heard all over the transmitter halls. We managed to generate quite a bit of ozone that day. The "signal" was located at 1340 KHz on the broadcast band. One of the guys jumped in his car, for a "field strength measurement". We were getting out to 5 miles, and the signal was very narrow band, NOT what we had expected to see. Tuning to 1330 or 1350, the signal was gone. Things were progressing well, until the output capacitor managed to set the workbench top on fire! So ended the great spark experiment. These stories are true. Only my name has been mentioned. OK, have you ever really seen the color "electric blue"? I have, and it is something not to be forgotten. Late one afternoon, it came time to kick the tires and light the fires on one of the Collins 821-A1 250 kW transmitters. As soon as I pressed the plate on button, the transmitter immediately shut down. There were a couple overload indicators lit up, but nothing to worry about. 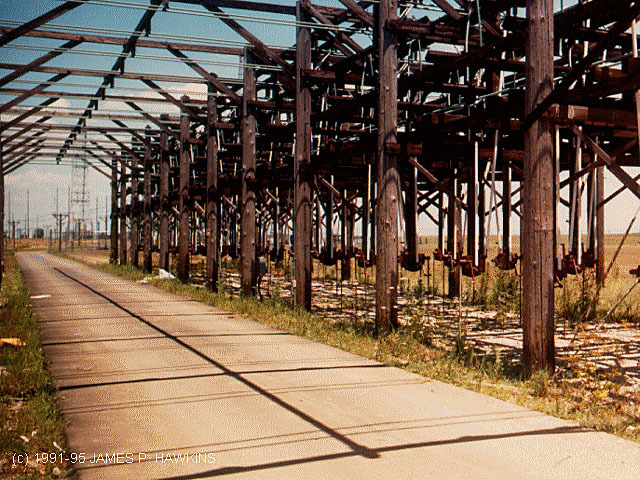 They were SWR indicators, and they were a usual occurrence at Bethany, running open 300 ohm transmission line. Local flying wildlife would make a stop on the lines, and become a part of the transmission line for a few milliseconds, when the rig first came up. Then they would kinda fall in bits, to the ground. More like an explosion, really. This afternoon, when the transmitter restarted, I heard a loud hissing inside the transmitter hall. Being on the short side, I could not see over the top of the transmitter, so I stepped up on the raised floor. There before my eyes, was a blue flame, shooting out of the side panel of the RF output tuning network. 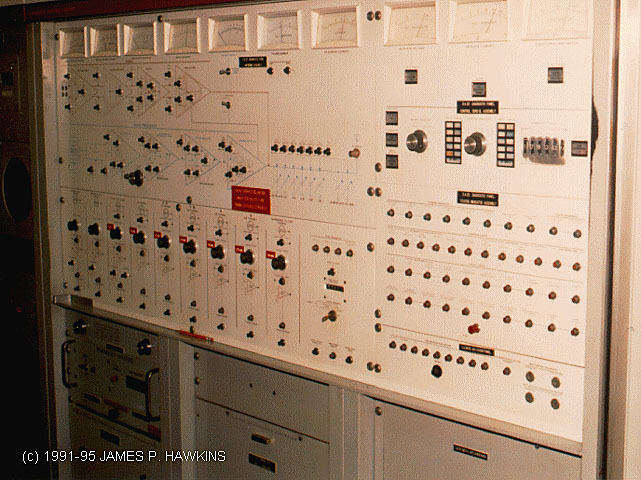 When the transmitter had originally overloaded, it caused a small amount of smoke inside the output stack, and when it came to life, it ignited the aluminum side panel. In a matter of maybe 10 seconds, I had managed to burn a 18 inch long, 2 inch wide strip out of the side. After getting things shut down, we had to send the panel out to an automotive body shop the get the hole filled and ground flat. As you may have seen from the pictures Jim has of Bethany, our antenna switching was all manual. A technician had to go outside and throw at least 2 of the antenna switches, sometimes more. During the Crosley days, it was not uncommon that the operating crew tried to out do each other on frequency changes. It would take 3 people at least 7 minutes to remove the loading caps and coils, along with antenna change switching. My crew had been getting good at these changes, we could do it in under 6 minutes, IF we really hustled. We got the bright idea to automate the antenna switching. On the way in this one day, I stopped at the hardware store and bought about 200 feet of 1/8" nylon cord. This was going to be our automation system. Before the A.F.R.T.S. frequency change to 6.030 MHz, I and another guy ran this line out to the antenna switch, and pre-set all the other switches, so we had only one to worry about. The line ran up the pole, to the switch handle, and was secured at the bottom, so that it came off at about 90 degrees, and run back into the building. At the prescribed time, the transmitter left the air. The crew went to work, changing the coils in the RF driver stage, and removing the 15 MHz shorting bar from the output tank circuit. After about 6 minutes, we were ready for the antenna change. One of the guys grabbed the line and pulled. And pulled some more. No one had remembered that nylon stretches, and it surely did that day. After on off air time of about 8 minutes, the switch finally dropped, but didn't have enough energy to close. So, someone had to run outside after all, and close the switch. I think we set a record that day….about 10 minutes for a frequency change.